Trinity College School’s “mathletes” had a strong showing in this year’s Canadian Team Mathematics Contest, with one team finishing in sixth place overall. Hosted by the University of Waterloo’s Centre for Education in Mathematics and Computing (CEMC), the team event is part of a series of math contests held each year for young people from Grades 7 to 12. 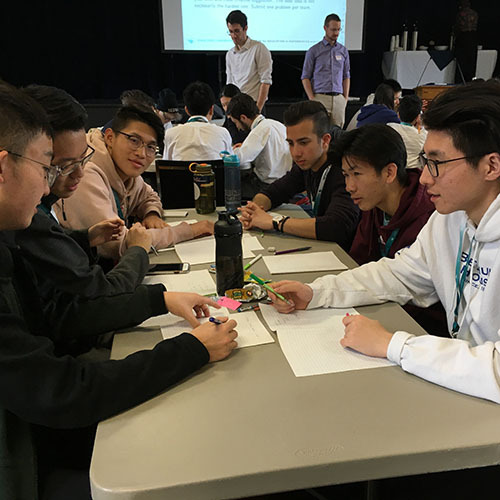 In the past, TCS students selected to participate in the team contest have travelled to Waterloo for the event, but this year ISOMA (Independent Schools of Ontario Mathematics Association) schools were able to attend an event hosted at Pickering College. On April 11th, two teams of TCS students joined 17 other teams for the event. “TCS 1” scored 139 points for a sixth place finish, while “TCS 2” placed 13th with 119 points. The contest involves groups of six students working on team questions (in which they collaborate), individual problems, and finally math relays, where one student’s answers are required by a teammate in order to solve the next question. This event stresses many of the 21st century learning skills which are part of the School’s academic vision, including collaboration, communication, creativity and critical thinking. Congratulations to our mathletes on a great day representing TCS! Visit the Canadian Team Math Contest ’19 gallery for more photos.